I really TRY to like Monday's but it's the end of our only day off together so it's hard to truly like it! We had such a nice day yesterday! We went to a sandwich shop in downtown Tampa (West Tampa Sandwich Shop) to get sandwiches. Let me tell you, I ordered the Honey "Obama" Cuban. Apparently President Obama ordered it when he was here one time. It's a cuban sandwich with honey baked on top of the bread. Amazing. Marc got the shredded steak sandwich which had potato fries on it - he loved it! Delicious! We will definitely return there. The sandwich shop is right by the Humane Society so we took a talk through there and then went to the beach! We found a nice little secluded area and ended up being too cold so we went out to the main beach. It's funny how spring breakers are so "hot" in their bikini's and I was sitting under a blanket! Nothing ends a perfect beach day better than some italian ice from Rita's! Anyway, today is back to work and a walking field trip to the Golf Course across the street. 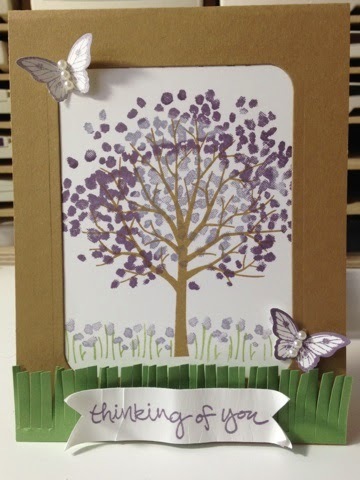 My cards today are both very similar and use Sheltering Tree. These are both true "Pam" creations and I hope you enjoy them! Aside from the Hardwood Background, everything else is from the stamp set! This first card reminds me of April in Michigan! I really enjoyed making this card. 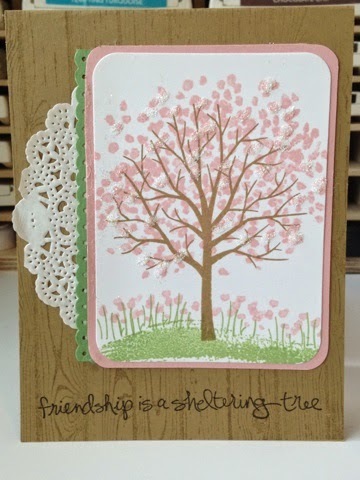 I used the idea from a card I made at the Stampin' Across America event I went to in Salt Lake City at convention last summer! Do you love it?! I think the purple card is my favorite! Post a comment with your favorite card of the two (pink or purple) and be entered to win a set of cards using this stamp set (winning comment number picked at random)! Some of the examples haven't been seen yet so you don't want to miss it!!!! Thanks for following me and looking forward to your comments! Giveaway ends on February 24th at 8pm EST!!! Purple is my Favorite one...well done I love this stamp set!!! I love this stamp set it is like playing with crayons! My favorie would be a combination of the two cards because I love elements of both immensely! If I had to chose one of them, I guess that I would have to pick the pink version. I am totally head over heels for this stamp set too!